I was born on 23 December 1962 in Arad, a medium-sized, ethnically diverse city in the western part of Romania, directly on the border to Hungary. In those days, Romanian, Hungarian and German were the languages that could be heard on the street in a frequent mix, and most locals – including simple folk – spoke two or three of these languages fluently. Ethnic conflicts were unknown, because until 1918 the area was part of the Austro-Hungarian Empire, and linguistic and religious diversity was the normal state of affairs. My parents originated from a place a few kilometres further north, called Santana (German: Sankt Anna), which was founded by German immigrants in the 18th century. Most people in Sankt Anna, including my parents, spoke German as their mother tongue, or, more precisely, a dialect spoken in south-western Germany at that time. This is where I spent most of my childhood. My father worked as an engineer in a managerial position in a company. My mother was a primary school teacher. Actually she would have liked to study mathematics, but in communist Romania in the 1950s this wasn’t possible due to her allegedly ‘bourgeois’ background. She was expelled from school several times, and only later was she able to obtain her school-leaving certificate with considerable effort. This circumstance, as well as several other calamities that befell the generation of my grandparents in 1945, including ethnically based material dispossession and deportation to Soviet labour camps, eventually led to the view: ‘No one can take away what you have learned. And you always carry it with you wherever you go.’ Education was about the only asset worth achieving. For this reason, our house was full of books. My parents acquired anything that even remotely seemed interesting. And they liked to travel – but that was only possible within the borders of the country. Nevertheless, we were aware of what was happening outside Romania, as we were well informed from listening to Western radio stations. My mother being a teacher, who understandably did everything in her power to educate me early, I learned to read at a young age. And because I didn’t particularly like kindergarten, she often took me along to her classes. Things were more exciting there. I had no siblings, and I spent many hours with books such as an encyclopaedic lexicon from West Germany, which I studied in detail. I was especially fascinated by things such as the chain reaction, even though I didn’t quite understand it. And I still vividly recall watching the moon landing on television which was otherwise full of communist propaganda. But this made the highlights all the more interesting: science fiction thrillers from America that were aired on Sundays in English with Romanian subtitles. That was very exciting, and somehow the aspiration grew in me that I later wanted to become a scientist. Our classes were held mostly in German, because Romania maintained basic education in all the minority languages. We learned French as a foreign language. In retrospect, I believe I was very fortunate that many of my teachers at the time were in their twenties or thirties and that they were highly motivated to inspire their pupils. I still remember how my chemistry teacher (Figure 1) explained the basic principles of atomic structure in a compelling way, and how amazed I was to learn that most of the atomic mass resided in the much smaller nucleus. Figure 1. 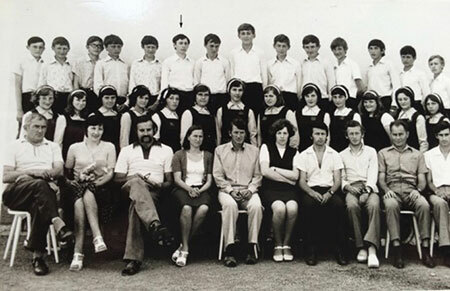 Stefan Hell (top row, 6th from left) with grade eight schoolmates and teachers of the German division of elementary school in Santana, Romania in 1977. Teachers in bottom row: Ms. Martini (mathematics, 2nd from left); Mr. Hans Kling (chemistry, 3rd from right). After grade eight, at the age of fourteen, I was able to obtain one of the few places at the Nikolaus Lenau Lyceum in Timisoara, one of the best secondary schools in the country. There you could specialise in mathematics and physics, and it was there that I was first propelled towards physics, as I had won a local competition and realised that physics was fun. On the other hand, daily life was difficult, and I associate my time in the school dormitory in Timisoara with going to bed with a grumbling stomach. It was, after all, communist Romania, and Ceausescu was in the process of expanding his dictatorship. The regime in Bucharest – unlike the normal people on the street – was growing increasingly nationalistic and bizarre. The flood of propaganda let the feeling grow that it’s not good to live under a dictatorship – especially with a minority background. And it was easy to conclude the latter from my last name. And another feeling took root in me: things that are publicly asserted and constantly repeated aren’t necessarily true. Quite the contrary: I became sceptical about accepted opinions. Coupled with having no prospect of improvement, all this meant that most of the people who could even remotely claim a German or Jewish background tried to leave the country. But that was far from easy. When a classmate emigrated with her family, I convinced my parents that they too should apply for an exit visa. Besides, my mother had been diagnosed with a disease two years earlier, and one of her doctors recommended emigration to Germany, where she could receive better medical care. After two years of uncertainty and inconvenience with the officials, we were allowed to leave for West Germany with a few belongings. It was on April 8, 1978; I was fifteen. We had no close relatives in Germany and settled in Ludwigshafen, an industrial city west of the river Rhine, far away from the iron curtain. I also found Ludwigshafen to be good, because I had seen on the map that the university town of Heidelberg was just a few kilometres away, and that struck me as a goal worth pursuing. I was thrilled about the opportunities in the West, though this was also accompanied by my parents’ struggle to settle in Germany. In Ludwigshafen I attended a secondary school, and soon realised that I was far ahead of my classmates in the sciences. I also had a fantastic physics teacher, Mr. Ecker, who gave me great encouragement. Then again, my English was limited to what I had picked up from non-dubbed American and British films in Romania. Finally, I learned that I could graduate from secondary school with only French as foreign language, and I took advantage of a rule that allowed me to graduate one year earlier than usual. I did that and began to study physics at the University of Heidelberg in 1981. Studying physics was the next great liberation, because the material to study was not dependent on zeitgeist or politics. At the same time, the atmosphere in Heidelberg was very conducive. On Friday evenings there was a colloquium, followed by wine and pretzels for all. The first speaker I heard in the colloquium was Isidor Rabi. Unfortunately, it wasn’t easy for me, because after briefly starting in German, he switched to English at some point. Nonetheless, seeing and hearing one of the greatest scientific minds of the 20th century was an important and highly motivating experience. I don’t know if I stood out as a student. In any case, I was always dissatisfied when I had the impression that the lecturer failed to get to the heart of the matter. I could never accept arguments such as “if you do the maths, you’ll know why this is so.” I firmly believed that everything could be boiled down to simple principles. And if that wasn’t possible, one simply didn’t understand the matter. Be that as it may, a consequence of this attitude was that during my studies I spent hours and hours thinking about how I could distil down phenomena and concepts to their essence. During the vacations, I managed to hide out in my room for months – much to the concern of my friends – ‘picking apart’ textbooks from morning till late and writing my own version of the subject in stacks of notebooks. Some days I only progressed by one or two pages, and it was frustrating when I still hadn’t grasped the core of the matter. But it was fantastic to eventually ‘discover’ what the core was. I was also of the opinion – and it’s probably true – that I am terribly bad at memorising things, and if I didn’t understand something exactly, I would forget it and fail my oral exams. Fortunately, that did not happen. Like many physics students, I had planned to specialise in particle or nuclear physics, and Heidelberg was the place to do it. On the other hand, I heard that it was disillusioning to work on large projects and that job prospects were not good. The latter consideration proved decisive, because my father’s job was becoming increasingly uncertain, and my mother was again diagnosed with a serious illness. As the time to work on my diploma thesis approached (a final master’s thesis lasting up to 2 years), I opted – against my inclination – for a topic which I believed at the time would provide good prospects of finding a job. It was about microlithography, the production of fine structures in photoresist material for computer chips. Professor Siegfried Hunklinger from the Institute of Applied Physics, a low-temperature solid-state physicist who had just moved to Heidelberg from the Stuttgart-based Max Planck Institute for Solid State Research, wanted to produce piezoelectric surface-wave transducers lithographically and had teamed up with his colleague, Professor Josef Bille, to construct a laser scanner that could be used to write microstructures. I must have done my diploma thesis work reasonably well, because I was one of the few students Professor Hunklinger planned to keep for doing a PhD. But, for my doctoral thesis, I wanted to focus on something less applied – which wasn’t so particular, because most of the other students were concerned with low temperature solid-state physics. Actually, Professor Hunklinger had kind of planned that for me as well, but in the end it turned out to be a subject which again had a touch of applied physics. And I didn’t have the courage to say that I would do it with little passion. As it happened, Professor Bille and Professor Hunklinger had just founded Heidelberg Instruments GmbH, a start-up company developing laser-scanning optical systems for a broad range of applications: optical lithography, ophthalmology, and confocal microscopy for biology, as well as microlithography inspection. Confocal microscopy was about to emerge as a new microscopy technique, having the advantage of suppressing light from above or below the focal plane. In the mid-1980s, it was therefore believed that this could be used to measure transparent 3D photoresist microstructures more accurately, which was important for the mass production of computer chips. My task was to find out if and how this would work. However, that wasn’t easy, because the structures on the silicon wafer were transparent and had about the same width and height as the wavelength of light. The confocal principle was not really able to solve the problem; rather it produced complex images that changed drastically with minute changes in the dimensions of the structures. I called the images ‘aliens’, because they reminded me of the figures of a popular computer game at the time. At first, I wanted to find a mathematical model to predict them, but there were too many process parameters to deal with, and ultimately such an approach would be impractical for a semiconductor manufacturer. As the only physics graduate student at Heidelberg Instruments, I was more or less on my own. Occasionally, I was able to turn to the company’s development manager, Roelof Wijnaendts van Resandt, who had run a group on confocal microscopy at the Heidelberg-based European Molecular Biology Laboratory (EMBL) a few years earlier. But he had little time for me, because the company was struggling to survive. There was also a biology graduate student, Werner Knebel, who was investigating the suitability of confocal microscopy for cell biology. We often talked to each other. I explained to him the physics of image formation and he introduced me to fluorescence imaging in biology. Otherwise, my routine was interrupted only by my walks to the weekly seminars on solid state physics, teaching duties, group meetings, and the colloquia on Friday evenings. I was quite frustrated. Actually, I wanted to do something more exciting than optical microscopy – which I perceived as a boring physics subject of the 19th century, which had nothing to offer apart from diffraction and polarisation. In the interim, I had received a stipend from a foundation, meaning that I wasn’t dependent on the company. I also knew that my thesis advisor was a ‘real’ physicist with a passion for physics. So I started to ask myself whether there might be an interesting problem left in optical microscopy after all. The only thing that still seemed interesting in my view was the diffraction limit of resolution. So I figured that breaking this limit would be really new and exciting! All of a sudden, everything looked brighter, because thinking about light microscopy took on a new meaning. So I decided to pursue the thesis work as initially requested, but what really motivated me was the resolution problem. I knew of course that near-field optical microscopy existed, but it seemed to me like a kind of scanning tunnelling microscopy. In contrast to that, I wanted to come up with a light microscope that looks and operates like a light microscope – but without the limits set by diffraction. So I began to comb through my textbooks again, searching for phenomena suitable for overcoming the diffraction barrier. I pondered all kinds of options from the Stark to the Zeeman effect. I even checked textbooks on nuclear physics. My efforts weren’t initially met with success. But one thing came up most naturally: Virtually isolated from the optics community, I had figured out how to calculate the focal light field at large focusing angles, and had written a computer program to do so. I had solved the problem in my own way and had lots of fun playing around with the field calculations, which worked beautifully. The largest focusing (i.e. aperture) angle of the best objective lenses at that time was around 71°. Of course, I also plugged the theoretically largest value of 90° into my program, which corresponded to a converging hemispherical wavefront. I also calculated what would happen for a complete sphere. While the last two cases were interesting but impractical, it was far more realistic to calculate what would happen if one juxtaposed two lenses with a 71° aperture angle and caused their wavefronts to add up constructively at a common focal point. That the main diffraction peak would become three to four times sharper along the optical axis (z) than with the best single lens was to be expected. However, less obvious was the outcome that the secondary diffraction peaks along the axis were small enough to be discriminated against in a potential image; they would not produce ambiguities or ‘ghost images’. So it seemed feasible to improve the resolution along the optic axis by 3–4 fold, by using two counter-aligned ~70° lenses in a coherent manner. That was the idea behind what was later to be called the 4Pi microscope. Back then I called it the double-lens microscope and presented the results sometime in 1988 in Professor Hunklinger’s seminar series – as an addendum to what I was actually supposed to do. The idea was perceived as interesting, but the difficulties in aligning two lenses to focus at the same point and controlling the phase of the wavefronts were thought to be daunting. And, of course, the concept wasn’t suitable for silicon wafers – only for transparent specimens such as biological cells. Actually, I set off to try it out, but Heidelberg Instruments disintegrated into several subunits in 1989, and Prof. Hunklinger resigned from it. It is left to be noted that the subunit dealing with confocal microscopy was purchased by the company Leitz which later became Leica Microsystems GmbH, a leading supplier of confocal microscopes. By the time I had completed my doctoral thesis in the summer of 1990, I was convinced that there must be a way to improve resolution in a more fundamental way. With the two-lens approach I had at least found a beginning, albeit only within the limits imposed by diffraction. But the mindset that I had constructed for myself, picking apart textbooks, told me that physical phenomena must exist that should be suitable to overcome the barrier radically. So much progress had been made in physics in the 20th century that there had to be at least a single phenomenon that should enable lens-based optical microscopy with resolution at the nanometer scale. My stipend had run out, and I had asked Professor Hunklinger if I could stay on another year to work on the resolution problem. But optics wasn’t his field. It was clear that I would have to go my own way. This wasn’t easy because at that time there were no structures in Germany to give young researchers a start. Usually, you needed a professor (mentor) for whom you would work for several years while working towards your habilitation, a postdoctoral degree required for having one’s own students and to lecture. I neither had such a mentor nor was applying for a postdoctoral position in the USA an option. First, I didn’t know anyone there; second, my English was rather modest. Fortunately, my grandparents, who had meanwhile followed my parents to Ludwigshafen, had saved 10,000 Deutschmarks, which they gave me as a present when I was awarded my doctorate. I sat for a couple of weeks thinking about how I could build a ‘double confocal microscope’ with two juxtaposed lenses and used the money to pay an attorney to file a patent on it. Since I had worked in the setting of a start-up company, I thought that I may be able to persuade Leica or another big company to support the development. But things worked out differently: Roelof Wijnaendts van Resandt introduced me to his former PhD student Ernst Stelzer, who had succeeded him as head of the microscopy group at the European Molecular Biology Laboratory (EMBL) in Heidelberg. I indicated to Ernst that I wanted to work on the resolution question, and he offered me a stipend for a few months, on the condition that I would apply for external stipends for the rest of my stay. One has to appreciate that at the time there was a surplus of physicists in Germany, and the prospects of doing academic research were poor. However, I had just learned the hard way that it is a mistake not to do what you really enjoy. I therefore wrote up a small application for a stipend to the German Research Foundation (DFG), the main funding body in Germany. Essentially, I described the double-lens microscope and my view on the prospects of improving the resolution in a lens-based light microscope. Although located in Heidelberg, the EMBL is legally outside Germany, which meant at that time that I could not be funded by the DFG unless my application was formally supported by a German university. Since I could no longer appeal to Professor Hunklinger, I consulted the directory of physics professors at Heidelberg and picked out two whose interests seemed most closely related to the subject. The EMBL was a great place. It was international, and the working language was English. I took advantage of this time to learn English, and after I had listened to many presentations, I eventually plucked up enough courage to present in English myself. I had no choice after all. With Ernst Stelzer I had agreed to build the microscope with the two counter-aligned lenses, to see if the axial resolution increase could be realized. It wasn’t easy. I remember that in December 1991, one day before my birthday, I had the first clear indication that it was feasible. The key was that I could exactly predict what the experimental data should look like, so I was able to discriminate against misalignment. In the publication, Ernst suggested that we call it the “4π microscope,” which I wasn’t particularly happy about. For one thing, the solid angle of the double lens arrangement was far from 4π. Furthermore, the actual discovery was that ‘4π’ wasn’t needed to increase the axial resolution; two high-angle lenses were sufficient. Moreover, the Cremer paper had drawn an improper physical conclusion (i.e. a point-like spot of light) and had completely missed the axial resolution increase as the actual benefit of adding the other side of the solid angle. Ernst and I finally compromised not to use the Greek letter π, but the Roman letters Pi. Whether I liked it or not, the name 4Pi stuck. The group was later reinforced by two talented physics diploma students, Gernot Reiner and Steffen Lindek. Since Ernst did not have the habilitation, the thesis works were officially handled by Professor Cremer, who became increasingly interested in the resolution topic. In this quest for increasing axial resolution using two lenses, it was not enough to produce a focal interference pattern with counter-propagating waves. The challenge was to create a main focal diffraction peak with negligible secondary ones, i.e. an optical transfer function of the microscope that was both expanded and contiguous along the optic axis. Otherwise, one would end up with image artefacts. With the use of the two-photon excitation modality introduced in microscopy by Winfried Denk and colleagues, making contiguous transfer functions became reliably possible. But there were still no images of biological specimens taken and, of course, using two opposing lenses didn’t break the diffraction barrier. The latter particularly vexed me. However, the good thing was that the resolution question in far-field microscopy had been raised for all to see, and, importantly, I had a foot in the door. Ernst Stelzer and I ended up with very different views on how realistic it would be to overcome the diffraction limit. We parted ways in 1993. He went on to tilt two low-angle lenses so that they were at almost 90° to each other and called it confocal theta microscopy. Later he refined this arrangement into what is now called the light-sheet microscope. In the spring of 1993, the stipend ran out, and I could no longer stay at the EMBL. The DFG, which had just set up a special funding program called ‘New Microscopy for Biology and Medicine’, told me that I couldn’t apply for research funds because I had no job and no laboratory to work in. They funded a couple of near-field optical microscopy projects though. But once again I was lucky: Also working in the Stelzer group was a Finnish colleague, Pekka Hänninen, who planned to return to Finland. Pekka had realised the timeliness of the resolution topic and introduced me to his future professor, Erkki Soini of the University of Turku, who offered to submit a research proposal on 4Pi microscopy to the Academy of Finland, basically on my behalf. The Academy agreed to fund the project, on condition that I worked in Turku. So I arrived in Turku in the summer of 1993, and Erkki Soini, Pekka, and I worked very hard to set up a small optics laboratory. We started where I had left off at the EMBL, namely with 4Pi microscopy – first, because it was the only tangible approach at the time, and second because the credibility of the whole endeavour was at stake. Rumour was that my efforts would end up like all other far-field optical ‘superresolution’ efforts before, namely as an academic curiosity. The situation was not helped by the fact that Ernst Stelzer started to distance himself from the ‘4Pi’ work carried out in his laboratory in publications. At the same time, I felt that simply changing the way light is focused or re-arranging lenses will not change matters fundamentally. The only way to do so would be either via some quantum-optical effects or – what appeared more promising – via the states of the molecules to be imaged. The molecules whose states could be most easily played with were fluorescent ones, which, fortunately, were also those of interest in the life sciences. On a Saturday morning in the fall of 1993 I was browsing through Rodney Loudon’s book on the quantum theory of light in the hope of finding something suitable. A few weeks earlier I had imagined what would happen if the fluorescent molecules would be re-excited from the excited state using slightly offset beams. When my eyes caught a chapter dealing with stimulated emission, it dawned on me: Why excite the molecules, why not de-excite them, i.e., keep them non-fluorescent in order to separate them from their neighbours. I was electrified by the thought and immediately checked Fritz Schäfer’s book on dye lasers to see what was reported about the stimulated emission of fluorophores such as rhodamines. A quick assessment showed that an image resolution of at least 30–35 nanometres could be achieved in the focal plane, i.e. 6–8 times beyond the diffraction barrier. That was amazing. It was also instantly clear that the achievable resolution only depended on the intensity the sample would tolerate, and in principle was unlimited. What also intrigued me was the fact that the resolution could be obtained without a priori assumptions about the distribution of features to be imaged. This was because at that time, it was widely believed that the route towards higher resolution in the far-field was data processing, which typically required some assumptions about the object. However, in my case, mathematical processing was not needed. The concept was based just on the use of a basic state transition, i.e. “just on physics.” I finally had an example of the type of approach I had been seeking for. It was the concept of STED microscopy. But it wasn’t so easy to test this idea in Turku. I also thought that a tunable dye laser would probably be needed to optimise for de-excitation. But there was no dye laser to be had far and wide. After explaining the concept to Pekka, Erkki and other friends in the laboratory, I called up a former student friend from the Hunklinger laboratory in Germany, Leonore Hornig, who had become a patent attorney in the interim. I explained the idea to her and briefed her on filing a patent. I also felt that I should publish the idea in theoretical terms in such a way that it was as close as possible to reality and therefore hard to challenge. Before I left Heidelberg, Jan Wichmann, a physics student whom I knew privately, had expressed his desire to come to Turku for two weeks in December to work with me as an intern after finishing his diploma work with Prof. Jürgen Wolfrum. I explained the concept to him and asked him to model it numerically to be sure that the numbers were as close as possible to a real experiment. Jan’s preference was to use Gaussian beams because those could be handled relatively easily by the algebraic program Mathematica. The numerical evaluations of the rate equations largely coincided with my initial assessments. In any case, the paper proposing STED microscopy eventually read like a recipe: it was full of numbers. I tried hard to omit anything that could be interpreted as an oversimplification or exaggeration, because, not having a mentor and knowing that it was just a theoretical proposal, I was very much concerned about a total rejection. On the other hand, the paper was written to convince the community that nanoscale far-field fluorescence microscopy is viable, as well as in the hope of getting a job and the funds to do it. Whether I would ever be able to realise it myself was indeed doubtful at that time, because the Finnish Academy grant was gradually nearing its end. Yet, in retrospect, I must say that the time in Finland was really exciting and decisive (Figure 2). Figure 2. 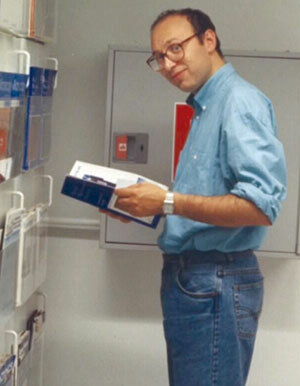 Stefan Hell at the Department of Medical Physics in Turku, Finland in 1993, at about the time of conception of STED microscopy. I also quickly realised that stimulated emission is not the only state transition that can be used to the same end. After all, the basic idea was to ensure that a part of the features illuminated by the excitation light remain briefly dark so that they can be separated from other features residing within the diffraction range. So I had the idea of parking the fluorophores in a dark metastable state, something dye laser operators were trying to avoid at all costs. This also had the important benefit of requiring less intense light. Since all my papers were published in specialised optics journals – which didn’t make my CV look particularly impressive – I submitted this proposal to a more general physics journal. When I received no response after months, I mustered all my courage and called the editor, who happened to be German. He told me that he had doubts about whether the diffraction limit could actually be overcome. He had sent the manuscript to three experts in near-field optical microscopy (!) – among them a famous one in the USA – and only one of them had replied. The reply was not favourable. It would all have to be demonstrated experimentally before making such claims, the editor said. When he realised my despair and that I didn’t really have the means to do that, he advised me to go back to Professor Hunklinger, so that he submits an application to the DFG on my behalf. I was terribly disappointed about the German academic system. Today, it’s perhaps hard to understand, but the 1990s were not particularly receptive to the notion of obtaining nanometre-scale resolution in a lens-based optical microscope. This can be readily concluded from the fact that no laboratory had tried STED, although I had advocated the concept with much passion since April 1994. In my opinion, there were two reasons for this. First, near-field optical microscopy seemed the way to go at the time, including for the life sciences. Eric Betzig, who worked at Bell Laboratories in the early 1990s, had published prominent papers, such as a Science paper in 1993, showing the near-field optical recording of single molecules at room temperature. The second reason was probably even weightier. In the 20th century, various people had repeatedly proposed concepts to overcome the diffraction barrier in the far-field, most prominently Toraldo di Francia and Lukosz. Yet, none of these concepts were practical, or got beyond a factor of two. So it was therefore natural not to take a far-field method like STED and related ideas seriously either. I was convinced that this time it would be different. My reasons were simple: STED fundamentally differed from other concepts in that it relied on separating features via the molecular states of the sample, rather than on tackling diffraction itself. But even more importantly, I could not find a basic physical oversight in my concept – in contrast to all of the ones reported until then. If problems were encountered in the realisation, they would only be technical, not conceptual in nature, which meant that they could be overcome through development. With the right transitions, one can transfer fluorophores between two states, such as a bright and a dark state, as one likes. When the molecule is in a dark state, that doesn’t mean that the (fluorescence) signal is lost; it simply isn’t produced. In other words, you can discern adjacent molecules by keeping some of them silent without losing anything, except time. If some signal is nevertheless lost, that is not due to the approach, but to the fact that something else takes place as well – something that is outside the conceptual framework. By discriminating against that, one can make the concept work. This insight gave me the courage to carry on with the development. However, a first research proposal submitted from Turku in 1995 to a European grant agency with a view to implementing STED was rejected. But fortunately, a Marie Curie individual postdoctoral stipend came through at the last minute. In this precarious situation, Prof. Soini advised me to license my 1990 privately owned patent for the double-lens microscope (a.k.a. the 4Pi) to a company in Turku, Wallac Oy, in exchange for research funding. The company’s CEO agreed to transfer 100,000 dollars to a university account. To this day, I believe that compassion played a role. Those funds were crucial, because they bought me time for a very fortunate event in my life: Dr. Thomas Jovin, the Managing Director of the Max Planck Institute for Biophysical Chemistry in Göttingen at the time, had become aware of my activities. An accomplished and open-minded scientist with Ameri- can background, who successfully kept abreast of the latest developments in molecular biology, fluorophore chemistry, and optics alike, he convinced Erwin Neher, Herbert Jäckle, Peter Gruss, Klaus Weber, Jürgen Troe and the other directors of the institute, to invite applications for setting up a small microscopy research group for five years. They had Winfried Denk (then at Bell Labs) or me in mind. In the spring of 1996 I spoke to Winfried on the phone. When he said that he wasn’t interested in this type of non-tenure track position, it came as a big relief. I had a good chance of securing the job. In the meantime, we had made progress with STED microscopy in Turku. After testing a few dye solutions in a cuvette with Ignacy Gryczynski of Joseph Lakowicz’ group in Baltimore that showed some fluorescence modulation, I found out that one could apply a heavily chirped Titanium Sapphire laser to turn off a dark red fluorophore (with the trade name Pyridin2) under microscopy conditions almost completely. This was not easy to work out, because unlike in a cuvette, in a microscopy sample, stirring is not an option to get rid of radicals and bleaching, and the intensities are by orders of magnitude higher. It was also difficult to demonstrate the resolution increase directly, because Pyridin2 could not be coupled to biomolecules. Fortunately, it occurred to me how it could be done indirectly: slightly offsetting the STED beam with respect to the excitation beam was expected to reduce the focal fluorescence region to subdiffraction dimensions. Translation of a confocal point detector across the image plane then proved that this reduction indeed occurred. The measurements were done together with a diploma student, Franziska Meinecke, in 1995. From that point on, I knew that STED microscopy would work – at least under certain conditions. Franziska was less optimistic. She gave up science finally, saying that she felt sorry for me: difficult research subject, little support, no real prospects, and lots of sacrifices. It was sobering to hear that from a student, but I decided to carry on. I didn’t write up those initial STED results because I thought that it may end up in a low-ranking journal again. However, in January 1996, I showed the data at the Friday physical colloquium in Heidelberg, where I gave a talk in front of my former professors including Otto Haxel, Franz Wegner, Joachim Heintze, and Dirk Schwalm, who asked questions at the end. It was my habilitation lecture, and habilitation was important to carry on in science and supervise one’s own diploma and PhD students (officially). Until then, Professor Cremer was taking care of the formalities. He thus also became co-author of some of the papers and advised me how to steer clear of political issues during the habilitation process. Today, I am very grateful that the physics faculty allowed me to habilitate in Heidelberg despite the fact that all the work was done in Turku. But contrary to many public assertions, I never was a student or a postdoc of Prof. Cremer. Nor did I work under his intellectual guidance. Rather the relationship reflected in part the inability of the German academic system of the 1990s to provide true indepencence to young researchers. In December 1996 I took up the position in Göttingen. It was just in the nick of time, as the money from Wallac Oy had run out. The Max Planck Institute in Göttingen was incredible because, for the first time, I was able to plan a little ahead and submit my own research proposals. I submitted a grant for STED to an agency of the German Federal Ministry of Research, which was promptly rejected. However, the officials in charge accepted my appeal and approved the grant against the scientists’ recommendations. Shortly thereafter, Thomas Klar applied to work as a doctoral student in my laboratory. Thomas grasped the STED concept quickly and was exceptionally talented. Combined with the much better equipment now available, in a few months we reproduced and outperformed the experiments carried out in Turku. 4Pi microscopy had meanwhile yielded compelling images, too. In 1999 Stefan Jakobs joined in as the first biologist postdoc, greatly extending the group’s interdisciplinary expertise. He had realised that the resolution was undergoing a transition and was attracted by the idea to pioneer its use in the life sciences. We were thus able to show beyond a doubt that the resolution of far-field fluorescence microscopy can be drastically improved, and also used in biological imaging. The paper was initially written up for the journal Nature, which decided not to send it out for review. I resubmitted it to Science, where it had the same fate. Eventually, it got published in the Proceedings of the Natural Academy of Sciences of the U.S.A. in 2000. This time we had been more fortunate. As we learned later, the manuscript ended up with Shimon Weiss of the Lawrence Berkeley National Lab, who had participated at a symposium a couple of months earlier, where I had presented the data for the first time. He and the other reviewers accepted the paper and Shimon wrote a commentary in PNAS pointing out its implications. Given its history, it was very pleasing to see this paper being highlighted in Prof. Måns Ehrenberg’s presentation of the 2014 Nobel Prize in Chemistry. The year 2000 was also fortunate in another aspect: I married my wife, Anna, a pediatric orthopaedic surgeon at the Göttingen university hospital, whom I had met in Göttingen in 1997. In 2002, to my surprise, the Max Planck Society offered me scientific membership at the Göttingen Institute, which meant tenure and a stable funding contribution to my science. Since 1994 it had been clear that any reversible transition between a fluorescent and a non-fluorescent molecular state is a possible candidate for overcoming the diffraction limit. In fact, everyone in my laboratory was instructed to keep eyes open for unexpected ways to modulate the fluorescence capability of a molecule. It was also clear that resorting to reversible on-off-transitions with long-lived state pairs would reduce the intensities required to overcome the diffraction barrier. The intensity issue was often cited against STED. Therefore, in 2003, to make chemists and fluorescent protein designers aware of the transformative potential of such on-off state transitions for microscopy, I wrote up a little communication to Nature. The communication highlighted the – in my view – historical opportunity to design switchable fluorescent markers for the purpose of breaking the diffraction barrier. This time, Nature sent out the communication for review, but all three reviewers rejected the paper outright, in fact with improper arguments and contentions. In my view, the actual reason for rejection was that “experts” in the fluorescence microscopy field did not (want to) accept that the resolution was about to undergo a historical change. And they did not understand that the fluorescent molecules were the key players in this change. They rather saw the field centred around multiphoton excitation, fluorescence lifetime imaging, and single-molecule detection, which no doubt were important, too. In any case, the paper ended up in Appl. Phys. A, where it was seen only by those who screened explicitly for it. Later, I asked myself what would have happened if the power of using photoswitchable molecules would have become apparent to the greater chemistry and biology community much earlier. In this situation, I felt that I had to advance photoswitchable fluorophore synthesis myself, which wasn’t so easy since organic chemistry and molecular biology was not my background. So, I expanded the laboratory to include organic chemistry (with Vladimir Belov), and switchable fluorescent protein development (with Stefan Jakobs). This allowed me to follow a more systematic approach for playing the “on-off game,” harnessing other state transitions as well, such as cis-trans isomerisation. The STED idea could thus be expanded to encompass other state transitions, and particularly to operation at low light levels (RESOLFT). Therefore, starting from 2003 I strongly advocated the development and use of photoswitchable fluorescent proteins and organic fluorophores, because I felt that they would have the potential to provide the ultimate solution to the resolution problem in fluorescence microscopy. STED ‘proper’ progressed as well. In 2003 we reported the first nanoscale far-field immunofluorescence images using STED. There were still hurdles to overcome. But many could be taken one by one – or the technological developments around us worked to our advantage. In early 2004 my mother passed away in Ludwigshafen, after a twenty-year battle against cancer. At around the same time, I also started to set up a small group at the German Cancer Research Center (DKFZ) in neighbouring Heidelberg to give researchers in this field direct access to the novel developments in microscopy. In the same year, the Howard Hughes Medical Institute (HHMI), a large philanthropic organisation in the USA, started to set up Janelia Farm Research Campus, a new type of institute where scientists are given ample resources and freedom to concentrate on important scientific problems. In 2004, HHMI and the Director of Janelia Farm, Gerald Rubin, asked the Max Planck Society and other organisations to help identify important problems to work on. I took part in two symposia for identifying such research topics, one of which I organised together with another Max Planck Society member in Munich. At this meeting, superresolution fluorescence microscopy was represented by myself and Mats Gustafsson, a spectacular Swedish colleague from the University of California at San Francisco. Mats had joined the field in about 1996–97 by introducing a widefield version of the two-lens (‘4Pi’) arrangement. A hallmark of Mats’s approach was to describe resolution and image formation in the spatial frequency domain. In fact, I never met a person who could think in frequency space as effectively as Mats. While I had not excluded obtaining superresolution in a widefield layout, I had felt that it would be easier to overcome the diffraction barrier first in a single-spot arrangement. This thinking was not wrong, but Mats advanced much further with widefield camera-based layouts than I and anyone else would have imagined. This applied not only to axial but also to lateral resolution improvements. He was of historical calibre. Mats and I were about the only ones pushing far-field optical superresolution in those days. At scientific meetings we would present our latest data right from the optical table – usually many months before submission. This aspect gave the meetings a certain flavour – to the point of occasionally being marked somewhat by our friendly competition. This applied also to the HHMI-Max- Planck meeting in Munich. It then became obvious to anyone that far-field superresolution fluorescence microscopy was a hot topic. It is left to be noted that Mats was later hired to Janelia Farm and sadly passed away in 2011 after having left a huge legacy in microscopy. In 2005 I received a very complimentary email from Eric Betzig saying he was entering the superresolution field again, attracted by my and Mats’s work. I had not met him personally, but I was aware of his eminent role in near-field optics in the early 1990s. However, this time Eric set out to work in the far-field. In fact, I had been asked by Janelia Farm seniors whether I felt Eric could still make a difference. I was very confident about that, given his accomplishments in near-field optics. And this turned out to be true, when I heard from him again about a year later. In 2005, my wife Anna gave birth to our twin boys Sebastian and Jonathan. The year 2006 was to become an annus mirabilis for the field. In 2005 my group had carried out three studies demonstrating for the first time that far-field superresolution fluorescence microscopy was able to give new insights in biology, (e.g. with Katrin Willig, Silvio Rizzoli, Thorsten Lang and Robert Kellner); they were published in early 2006. 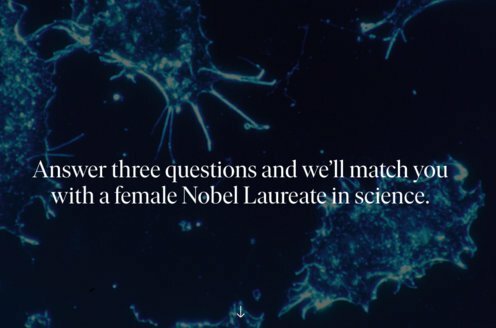 In this context, I am particularly grateful to my colleague Reinhard Jahn and Stephan Sigrist, now a professor in Berlin, who came up with interesting biological questions. In 2006, the development of the first commercial STED microscope was also completed. And, importantly, Eric Betzig and Harald Hess first realised and presented another major concept for far-field super-resolution, called PALM. Unlike STED or RESOLFT which briefly switched the fluorophores off using a pattern of light, PALM followed a ‘bottom-up’ approach: the molecules of the features to be resolved were stochastically and individually switched on and off, followed by localisation for position determination. The art of detecting individual molecules had been pioneered by W.E. Moerner and Michel Orrit and had co-existed with far-field superresolution imaging for about 15 years. Superresolution and single-molecule detection were in fact two different fields, each having their own dynamics and proponents. For example, until 2006, single molecules had been used in superresolution microscopy for testing the resolution only. The systematic use of on-off-switching for separating molecules individually in a spatially stochastic manner, as first done in PALM, added a new dimension to superresolution fluorescence microscopy. Eric’s work became public slightly before identical concepts were published by the groups of Xiaowei Zhuang (Harvard) and Sam Hess (U Maine), who called them STORM and FPALM, respectively. One year earlier, the groups of Paul Selvin (Urbana-Champaign), Nobert Scherer (Chicago), and Rainer Heintzmann (King’s College London) had come very close to this concept as well, bearing witness to the fact that, in 2005, far-field fluorescence nanoscopy was no longer an exotic topic. In any case, the works published in 2006 by Eric, who meanwhile had moved to Janelia Farm, Xiaowei Zhuang, Sam Hess and their teams gave the field an enormous boost. ‘Superresolution’ fluorescence microscopy or ‘nanoscopy’ as we understand it today, fundamentally differs from the diffraction-limited one in that the separation of adjacent structural details is not accomplished just by focusing the light in use, but through the transient occupation of two different molecular states. In my view, this principle is so fundamental that it offers many opportunities to develop a whole range of powerful superresolution variants. I am delighted to see how this field is unfolding and how it is advancing the life sciences as well as other areas. While 4Pi microscopy did not overcome the diffraction barrier per se, both STED-like and stochastic single-molecule-based variants of subdiffraction resolution fluorescence microscopy have now been implemented with ‘4Pi’ arrangements in order to provide the largest axial and hence 3D-resolution possible. Meanwhile all major microscope manufacturers offer ‘superresolution’ microscopes as their flagship products. In 2009 our daughter Charlotte was born. We are so grateful for having three wonderful children who enrich our lives and give us huge inspiration and motivation for the work that we do. In September 2014, I shared, with Thomas Ebessen and Sir John Pendry, the 2014 Kavli Prize in Nanoscience. The celebrations in Oslo were highly memorable for me, my wife and the children. As it turned out a month later, they were actually an exquisite “practice” for my family since another big event was to come. On October 8, I was informed by the Secretary of the Royal Swed- ish Academy, Prof. Staffan Normark, that I would share the 2014 Nobel Prize in Chemistry with Eric Betzig and W.E. Moerner. 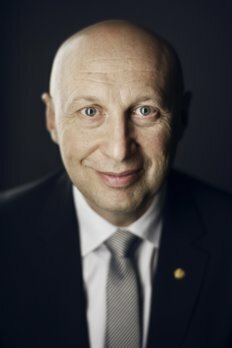 The Nobel week was a truly unique experience not only for my family but also for many members of my group and friends who joined us in Stockholm. I was fortunate over the years to be accompanied by further outstanding students and postdoctoral scientists who have joined this quest, each making important contributions: Martin Schrader, Alexander Egner, Andreas Schönle, Jörg Bewersdorf, Volker Westphal, Lars Kastrup, Jan Keller, Gerald Donnert, Johann Engelhardt, and Christian Eggeling, to name just a few. Although the work done by my colleagues and myself has received the utmost recognition, there is still much to be done, and I still have a lot of passion contributing to the advancement of this field. Today, now co-responsible for the new generation of scientists, I often wonder whether the way in which science is organised sufficiently encourages young researchers to pursue unusual research topics. So far I have kept myself well out of administrative duties and science policy-making – to the delight of my group, but not always that of my colleagues. But one thing remains close to my heart: I have recently launched an initiative to explore new ways of helping young researchers to embark on risky projects at an early stage of their career. And since many of my colleagues in the Max Planck Society also find this idea very interesting, I am optimistic that this endeavour will work out as well.